Arrival at Zagreb airport, the capital city of the Republic of Croatia. Private transfer from Zagreb to the Istrian peninsula. Accommodation in one of the agro-tourisms in central Istria. Agro-tourisms in central Istria provide not only accommodation in authentic rural areas and traditional food, but also the possibility that every guest meet the local people and learn their customs. Dinner. Overnight. After breakfast your first task is to get to know olives. You will visit one of the famous olive oil manufacturers, who will explain how to plant and grow up the olive groves, how to preserve them over the years, how to pick them up and, the most important, how to produce the best olive oil. You will have the opportunity to see how olive oil is practically produced. After olives adventure you will proceed to a cozy restaurant for lunch. After lunch you will take a ferry to visit the National Park Brijuni, an archipelago of 14 small islands, once a summer residence of former president of Yugoslavia, J.B.Tito. Return back to your agro-tourism. Meals for dinner cooked with olive oil. Overnight. After breakfast you will go on truffle hunting. You will visit Northern Istria where you will have the opportunity to participate in truffles searching with specialized trained dogs. You will learn how the truffles look like, what is the difference between white and black truffle, how to search for them and what is their use in cooking. Truffle products degustation follows. 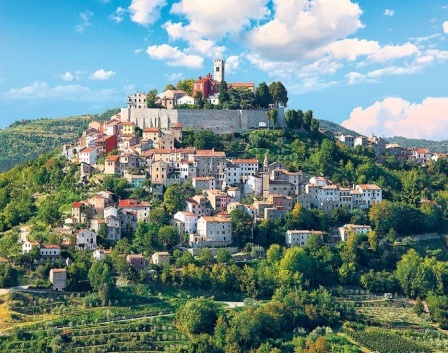 You will visit small hilly town of Motovun, famous for its appearance, city walls, magnificent views and a legend about a giant who used to live there. After that you will visit a town of Hum, famous for its title “The smallest city in the World”. Return back to our agro tourism. Dishes for dinner prepared with truffles. Overnight. Breakfast. Today is the day for relaxation and sightseeing. You will visit some of the places and towns of Istria: the biggest city of this peninsula – Pula and the most romantic city – Rovinj. After leaving beautiful Rovinj we head on towards a village famous for its competition for best prosciutto in Istria where during the lunch you will have the opportunity to taste some homemade products and prosciutto. An organized degustation of honey products follows near Pazin, the central city of Istria. Dinner. Overnight..
After breakfast you will start with the best and the most important task of this holiday: visiting the grape fields of Istria where you will share the knowledge of a wine manufacturer. He will explain to you the most important facts how the grapes are grown and how the best wine is produced. You will visit his cellar where you will have an organized wine tasting. Lunch at a local tavern. After lunch return back to agro tourism to enjoy a special dinner with different sorts of wines. Overnight. After breakfast you will visit a ranch. where there are organized different games, horse-back and jeep riding. Lunch at ranch or during the safari. Visit the bay of river Raša and St. Nikolaus point of view. Return back to agro tourism. Time to relax and pack suitcases. Dinner. Overnight. Breakfast. Private transfer to Zagreb airport for departure.